You're Invited: New York Junior League's Bags & Bubbles Silent Auction Fundraiser! 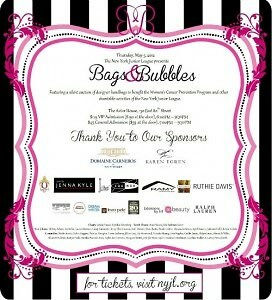 On Thursday, May 3, 2012, join over 500 fashionable ladies to bid on 150+ new and vintage designer handbags, sip Domaine Carneros champagne, and enjoy delectable foods and delicious sweets at the New York Junior League's annual Bags & Bubbles silent auction fundraiser. At the ultimate girls' night out, guests bid on new and vintage handbags including designers Celine, Christian Dior, Coach, Cole Haan, DKNY, Givenchy, Gucci, Henri Bendel, Lauren Merkin, Marc Jacobs, Missoni, 3.1 Philip Lim, Ralph Lauren, Rebecca Taylor, Ruthie Davis, and many more. VIP ticket-holders gain access an hour early for the first opportunity to bid and have exclusive access to the Beauty Bar, a beauty and party destination. Jill Harth, Extensions by Jill, Jenna Kyle, and more makeup artists and stylists; celebrity eyebrow shaper Ramy Gafni, IOMA skincare, Equinox, and many more will provide free services. VIPs also take home a special gift-bag with many items including Karen Egren and J.Crew Jewelry. The event benefits the charitable activities of the NYJL, including the Women's Cancer Prevention Program, which works with the American Cancer Society (ACS) and the Leukemia-Lymphoma Society (LLS). What: Bags & Bubbles Fundraising Event When: Thursday, May 3, 2012; VIP 6:00 PM, General 7:00 PM-9:30 PM Where: NYJL Headquarters, 130 East 80th Street, Between Park & Lexington RSVP: Purchase tickets here!